As some of you may know, the Super Bowl is being hosted in Indianapolis, Indiana this year. It is an honor for our city to be the home of such a large event! The city's plans are starting to come together now that the Super Bowl is only a few months away. This week, an official poster was released. 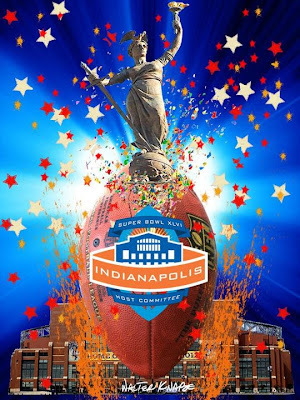 The Superbowl Host Committee's poster was created by Indiana artist Walter Knabe. An article by the Indianapolis Star states "His work is represented in galleries and museums around the world." After seeing the poster and reading the article, I was very curious and decided to find Knabe's portfolio website. While browsing through his website, I noticed he specializes in fabric and wall covering design. Yes, fabric and wall covering. Not graphic design. I was disappointed in the graphic design and originality of the poster. It seemed elementary. For examle, I found this file of idXentical Photoshop star brushes via Google in about two seconds. The ink splatter brushes could be found just as easily. The logo was already created and the other images could probably be found on Google Images. To be honest, any graphic designer in the industry could replicate this poster in about thirty minutes to an hour. Just to clear things up, this poster was not done by the National Football League (NFL). It was created for the Super Bowl Host Committee. So, why couldn't Indianapolis do better? There are several graphic design firms in Indianapolis that would have loved the opportunity to make a poster for the Host Committee. What do you think about this poster representing the Super Bowl Host Committee of Indianapolis? As you can tell, I am not a fan of the Host Committee's poster. Please leave comments; don't be a stranger! I am very interested in hearing other responses on this poster.